Nonsensible Shoes: Thursday Hillary Bash - Worried Yet? 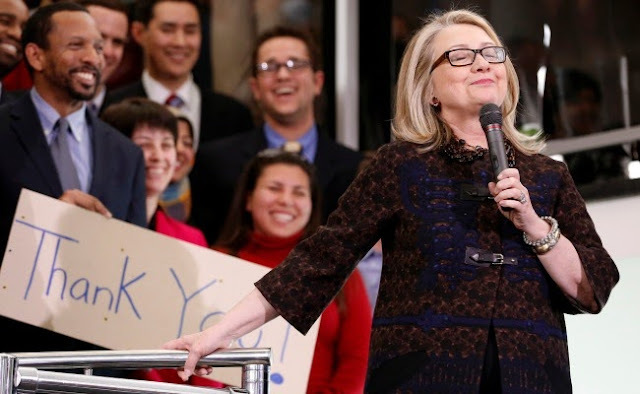 Hillary Clinton appears to be unstoppable as the presidential nominee and eventual winner in 2016. Are you worried yet? You should be. A national poll released Monday finds former U.S. Secretary of State Hillary Clinton an overwhelming favorite to win the Democratic presidential nomination in 2016, while Republicans remain heavily divided on who they want to see as their candidate. Clinton tops the CNN/ORC poll with almost two-thirds of Democrats in her corner in 2016. With the support of 65 percent of those surveyed, Clinton, who ran for president against Barack Obama in a close primary in 2008, has a clear lead over her potential Democratic rivals. Vice President Joe Biden places a distant second behind Clinton with 10 percent. Over the weekend, Biden visited Iowa, home of the first presidential caucus, to attend a Democratic event. Biden ran for the Democratic presidential nomination in 1988 and 2008. That's terrific, isn't it? While salivating at the thought of Democrats having Joe Biden as the nominee (think the second coming of Walter Mondale), the reality is that Clinton is going to be the nominee. She's seasoned and prepared from her failed run in 2008 in a way that Joe Biden cannot hope to be by his 2008 run. Those numbers are monsters. Don't expect there to be a stunning collapse of Clinton's numbers. True, it's early. But she has undeniable name recognition that will help her. Many Democrats are likely to be weary of Obama come 2016, but that will also play into Hillary's hands. Buyer's remorse might actually help her. It's not a matter of her supposed centrism relative to Obama's leftist policies, it's more a matter of a known commodity versus an unknown like Obama was in 2008. Democrats with buyers remorse will lean towards a more known commodity and that could help her in the center as well, as the GOP will be fielding what is already being positioned by the media as rookies. Obama's continued failures can only serve to help Clinton. On the other hand if he somehow manages to turn around his fortunes, that won't hurt either since Clinton was a part of the team for half of his tenure. In addition, the level of collapse required from these sorts of poll numbers is just too big. Her poll numbers are too big to fail, barring some dead bodies hidden in a liquor cabinet somewhere, or a sexting scandal perhaps. The general election will bring up an interesting dynamic. While Clinton really isn't a known commodity but rather a coattail commodity, her opponent will indeed be a lesser known. She'll have the advantage of incumbency though she hasn't yet earned it. She's going to be hard to beat her, because she's got a sense of incumbency with enough arms length from Obama that there really isn't a down side for her coming out of the gate. The issues with her track record (and maybe Benghazi can change this up), are numerous as I've started documenting in these Thursday Hillary Bashes. 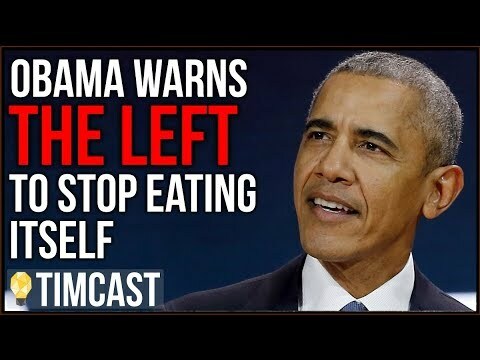 But as was the case with Obama, the media will be sure to filter out and downplay every possible aspect of those problems so that they won't sink into the mainstream consciousness. It's undoubtedly going to be an uphill battle for the GOP nominee and for conservatives in general in 2015 and 2016. There's a lot stacked against us.